The ITTF 2018 Hopes season is in full swing, having kicked off early in September 2017 with the Latin America Continental Hopes Week in Paraguay. The 2018 Hopes team for the World Cadet Challenge in Tottori, Japan, will be selected in August, at the ITTF World Hopes Week & Challenge in Alicante, Spain. On their way to Spain, the Hopes will have the opportunity to attend many national, regional and continental training camps and tournaments, led by our experts. March 16-18: USA Regional Hopes – Rosemead, California. April 6-8: USA Regional Hopes – Westfield, New Jersey. April 13-15: USA Regional Hopes – Alameda, California. April 20-22: USA Regional Hopes – Columbus, Ohio. April 27-29: USA Regional Hopes – Gaithersburg, Maryland. May 2-9: Africa Hopes Week & Challenge – Beau Bassin, Mauritius. May 31 – June 2: North America Continental Hopes – Markham, Canada. 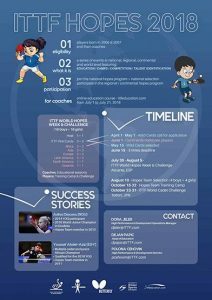 July 30 – August 5: ITTF World Hopes Week & Challenge – Alicante, Spain.